Debby Campbell was born in Albuquerque, New Mexico, in 1956 to Glen Campbell and Diane Kirk. She is the eldest of the entertainer’s eight children, and for 24 years, she sang with her father as part of his concert touring act. 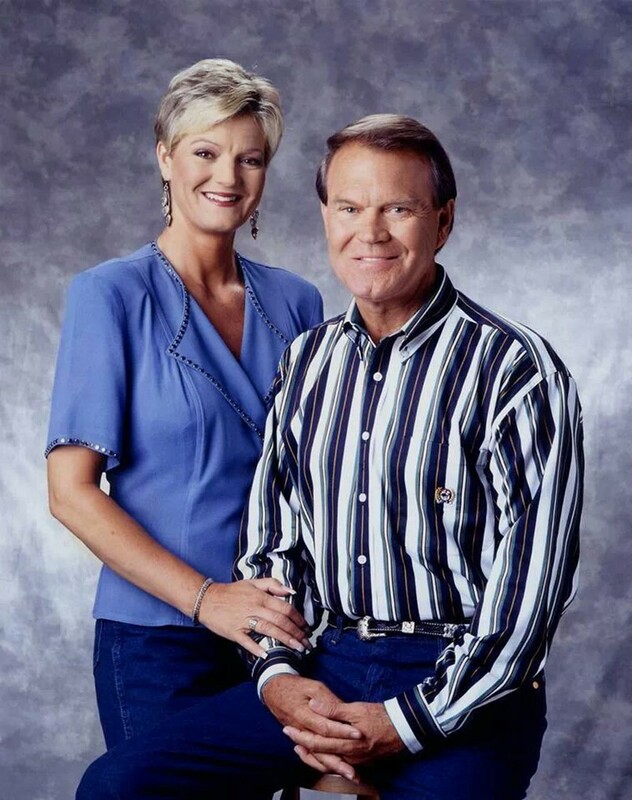 In 2014, with co-author Mark Bego, she wrote Burning Bridges: Life with My Father Glen Campbell, which tells her story of supporting her dad through four wives, drug and alcohol additions and finally Alzheimer’s disease that took Campbell’s life on August 8, 2017. In honor of Glen Campbell’s 82nd birthday on April 22, 2018, Debby released The Way We Were, a tribute album from daughter to dad. Produced by Tony Mantor and released by Plateau Music, this loving project features 12 iconic hits from Campbell’s catalogue. Melissa Parker (Smashing Interviews Magazine): Debby, why did you decide to record the tribute album now? Debby Campbell: Actually, I’ve been working on it almost two years. My friend, Bobby Wilson, who is Jackie Wilson’s son, has been working with this producer out of Nashville, and after I quit singing in 2011, they began hounding me saying, “Debby, get in the studio.” I’m like, “I’m not ready.” Finally, I said that I’d call the producer to talk to him, and I called in the latter part of 2016 and said, “I don’t know really if I can sing. I’ve been doing my flight attendant job, and I haven’t sung since I left dad’s entourage in 2011. I don’t know if my voice has held up. I’ve been smoking cigarettes and just doing everything bad you could do for a singing voice.” He goes, “Well, will you give me four songs?” I said I would, so I went in the studio, did four songs and after we listened, I thought, “I guess I can do this.” So it made me smile inside because I love to sing. During all this time, of course, I was visiting dad in the Alzheimer’s place. But I just wanted to make a CD that had everything to do with me and dad. That’s what I did. It was almost done in February of last year. I had a couple more songs to do, and then in August, dad died, and I couldn’t go back in the studio for a little while. It was just too hard to go in there and sing his songs. I finally began finishing it at the beginning of this year, and we decided to release it on my dad’s birthday. That’s how that came about. I’m getting a lot of great responses with the CD, and I hope everyone will get their copy. Melissa Parker (Smashing Interviews Magazine): Is there one song you performed with your father that was special to you? Debby Campbell: My favorites were “I Say a Little Prayer” and “By the Time I get to Phoenix.” I would start with “I Say a Little Prayer,” and then dad would do “Phoenix,” intertwining in the middle of the song. It was just a beautiful medley together. Of course, I loved doing “Let It Be Me” and “Little Green Apples” with him. I am so blessed, Melissa. I really am. I got to know the man, not the legend. I got to know my dad. I’m doing a show June 7 in Nashville, and it’s with second generation kids. Then I’m doing the Arkansas Country Music Awards. They are honoring dad and Johnny Cash. I’m going to be singing “Phoenix.” I’m excited about that. Melissa Parker (Smashing Interviews Magazine): Your dad was diagnosed with Alzheimer’s in 2010 or 2011? Debby Campbell: It was 2011, but we had taken him before then in Phoenix and talked to the doctors there. It was announced to everybody in 2011, but he actually had been suffering with it maybe six months before. Melissa Parker (Smashing Interviews Magazine): Glen would’ve been 82 this past April 22. What was the last birthday you celebrated with him where he still knew you? Debby Campbell: Probably the birthday before last year when he turned 80. Melissa Parker (Smashing Interviews Magazine): He still knew who you were at that time? Debby Campbell: Yeah. He was still knowing me pretty much up until he died. It wasn’t as immediate response, you know, when I’d walk it. It would take a little while. But even the caregivers said, “He really feels comfortable with you. He knows you’re somebody he loves dearly.” Dad would even say words to me right up until he died, which was kind of crazy, you know. Alzheimer’s affects everyone differently. I saw all these people there around dad, what they were going through and what he was going through. It just affects everybody differently. Melissa Parker (Smashing Interviews Magazine): I understand that music is a great way to break through to dementia patients. Debby Campbell: Right. Yeah. I think music is therapeutic. I don’t think that the tour they did with dad was therapeutic, all of those dates they did. I think that was a little too much for him. But I think music is definitely therapeutic. Melissa Parker (Smashing Interviews Magazine): You were not allowed on the farewell tour? Debby Campbell: I was not. Kim let me go in 2011. If you want the truth, Melissa, the tour wasn’t about dad. It was about getting her kids a career. She had my brother’s band opening for dad, and then they would have Kim’s kids, Shannon and Ashley, or the band Victoria Ghost (as they were known at that time), in the middle of the show where I used to sing with dad. They were selling out everywhere because dad was diagnosed with Alzheimer’s, so of course, the kids were playing in front of sold out crowds. That’s why they moved to Nashville, in order to give her kids a career. My dad hated Nashville, never wanted to live there in a million years. He would freeze to death there, too. He was always cold. He was a Phoenix guy. I think he was cold all the time because of low blood pressure. But Kim moved everybody there so her kids could get into the music business. Of course, right after she moved to Nashville, she put dad in a home. Melissa Parker (Smashing Interviews Magazine): And you never wanted that to happen. Debby Campbell: No. I found out on social media that Kim put him in a home. I got on the next plane to Nashville to find out where he was, and that was no easy task. I had to threaten media just so I could see my dad and know that he was okay. The minute I was fired from the tour, the band was also fired. That’s one more thing you don’t do when somebody has Alzheimer’s. You want to keep them in a familiar world. Melissa Parker (Smashing Interviews Magazine): With as little change as possible? Debby Campbell: Right. And Kim did everything against what you’re supposed to do. She fired the band of 25 years. She let go of me being with him on the road for 24 years. She moved to two houses in California and then moved to Nashville. She did not keep his world familiar to him. Melissa Parker (Smashing Interviews Magazine): Just to give her kids a career in the music business? I didn’t go to the shows to make trouble in any way. I went to see my dad to see how he was. In the last few shows they were doing, they had to bring dad in one or two minutes before he was to walk on stage because my brother’s band’s music was totally different than dad’s music. It made dad angry, and he would get agitated. I heard this from several people on the road that would still let me know what was going on. They said it got so bad they’d have to keep dad at the hotel until it was time for him to go on stage because he’d be yelling and screaming. Melissa Parker (Smashing Interviews Magazine): That must have been a horrible experience for your father. Debby Campbell: It was horrible. Absolutely horrible for him. Melissa Parker (Smashing Interviews Magazine): You lived apart from Glen during childhood? Debby Campbell: I didn’t grow up with dad, yeah. I lived with my mom and stepfather who was in the military, so we traveled a lot. I graduated from high school in England. My ex-husband was military, so I was in Italy for four years. So I was gone, and I had a family with three kids. Dad was always on the road touring. When I was younger and would go to California to spend summers with him, I was basically spending summers with Kelli, Travis and Kane because dad was still on the road touring. I actually spent more one-on-one time with dad when I lived in England, and dad would come over there when he was on tour. He would send a car for me at the air force base, and I would go and spend time with him in London or tour with him wherever he was going. I went on tour with him and Anne Murray one year. We moved to Colorado, then my ex-husband got out of the military in ’85 or ’86, and I said, “Let’s move to Arizona.” My mom and stepdad were in Germany at that time and ended up staying there for years. I wanted my kids to be around their grandfather, so we moved to Phoenix because dad was there. In 1987, dad was singing at the State Fair, and I asked, “Dad, can I sing with you tonight?” He said, “Sure.” So we worked on a song, and it went over well. From then on, the rest is history, and I ended up on the road with him for 24 years. We became best friends, Melissa, through all of that spending every waking time together. I took care of my father. I washed his clothes, got his meals for him and sent him out on his golf dates with his buddies on our days off. We became so close that he wanted me to go golfing with him all the time, so that’s how we spent our last years in Branson. I’d golf with him and his buddies every single day. I’d visit him in Malibu and go golfing with him and his buddies. We just became best friends. He looked at me and said, “Wow. So this is what it’s like to have a relationship with one of your kids.” That was just so special. I’m so much like him. I’m just very easygoing. I love people. That’s why dad had such a huge fanbase. They loved him so much because he was just a simple guy. He was so kind. He was real. There was no fakeness about him. You could not take the country out of that boy. Melissa Parker (Smashing Interviews Magazine): You have seven siblings? Debby Campbell: They’re all half siblings. I’m the oldest. I’m the only one from mom and dad. Melissa Parker (Smashing Interviews Magazine): You have a relationship with your half brother William Travis? Debby Campbell: I do. Yes. I have a relationship with him. Melissa Parker (Smashing Interviews Magazine): You and William Travis sued Kim Campbell, your dad’s last wife, alleging that she had barred you two from visiting Glen. Debby Campbell: When dad was put in the home, of course, everybody wanted to go see him. Kim and Travis have had a strained relationship for a long time, a very long time from what I know. That’s why Travis wasn’t around a lot because they just didn’t have a good relationship. I wanted my kids to have a relationship with their grandfather, and I wanted a relationship with my father, so I overlooked a lot over the years for the sake of what you do when you have mixed families. Kim is two years younger than me, so I’m sure I saw things that didn’t sit well with me, but that was my dad’s wife. That’s who he chose, so I had to live with that choice. There are things I can’t talk about right now because it’s still in court. But there were valid reasons, Melissa, why we took Kim to court. If you think I’m a person who wants to spend my hard-earned money out here flying the world as a flight attendant for 31 years and give it to a lawyer, that’s not my cup of tea. I had very valid reasons for going to court and protecting my father. We wanted to be co-conservators only because when I went to see dad, I wasn’t allowed to know what kind of medication he was taking. I wasn’t allowed to know anything that was going on with him, and I wanted to know. The only way you could do that is to have some sort of power, and I had none. Kim had it all. I just thought that dad needed a little bit more care than he was getting, and I wasn’t happy. That’s why we went to court. The judge looked at me as a jealous daughter trying to take his money, I guess, which it had nothing to do with money. We didn’t want anything to do with the finances. We just wanted to make sure that dad was going to be taken care of properly for the rest of his time on this earth. The judge took Kim’s side, the wife of 30-something years and probably didn’t understand anything that was going on. He probably didn’t do his homework, not knowing that I was actually the one who took care of him for 25 of those 30 years because we were on the road all the time while Kim was raising her kids and spending money. So we lost. It just looked like we were money hungry kids, which we are not. It has been a really ugly, ugly case. But would I do it again? Absolutely. There’s nothing that I did I would undo because it was all for the right reason, and when I go before my maker, he knows my heart. I’m good with that. Melissa Parker (Smashing Interviews Magazine): Kim recently spoke out, saying that she never stopped you from visiting your father. Debby Campbell: See, and I can’t say. I can’t say. I can’t give the facts. And she’ll be held accountable for that because she’s speaking about things that she shouldn’t be speaking of either. I mean, if the world could just know all the fact that are in there, they would know the truth. Melissa Parker (Smashing Interviews Magazine): Kim also filed a claim for $500,000 against Glen’s estate seeking reimbursement for his medical costs. Debby Campbell: My father had great insurance, for crying out loud. I don’t know about all that. It’s just outrageous, you know? I do know one thing. With her coming and saying my father had no good financial advisement, Stan Schneider was my father’s business manager for over 50 years. I’ve been privy to many conversations where Stan told my dad that he needed to curtail his wife’s spending or he would end up broke. Kim had my father in remodel hell for 25 years. Every house they were in was being remodeled. She bought a brand new house in Malibu, California, and then immediately ripped out the kitchen because the cabinets and everything weren’t expensive enough. She ripped out a whole staircase. Well, why don’t you just build the house from the ground up, for crying out loud? I’m not exaggerating, Melissa. I kid you not. If anybody wants to know where that money is, that’s where it all went. Stan took great care of my father. Kim was my father’s fourth wife, for crying out loud. My mom was not wealthy at that time because they were young. Through Billie and Sarah and those divorces, Stan took care of my father. He had money. Then he married Kim. She came from nothing and went and just spent it all. So if she’s saying my father didn’t have financial advisement, that’s not true. Kim Campbell is the one that spent all of my father’s money. But I’m done. I’m done with the lies. My dad isn’t here to defend himself. Stan and I are actually estranged because of all this crap. But I’m sticking up for him because I know damn well that he gave my father great financial advisement. Melissa Parker (Smashing Interviews Magazine): Do you have a relationship with Kim’s children? Debby Campbell: I have had interactions with the youngest three because my kids are the same age as Ashley, Cal and Shannon. Ashley has been in two of my kids’ weddings. It has been difficult, but we got through it because it’s not about us. It was about my boys when they got married, and that was fine. It went off fine, but I’m just pretty much over all of it. Dad’s no longer here, and we just go on. I’m just so over all of it. Melissa Parker (Smashing Interviews Magazine): What are some of your favorite memories of your father, Debby? Debby Campbell: Dad and I would be playing at John Ascuagas Nugget casino where usually we played for one or two weeks, and we’d go down to this dumpy little Laundromat down on the corner. Dad would have his ball cap on, and I would have my ball cap on. I’d do our laundry, and we’d sit there and play Gin (laughs). Just sitting and playing cards was one of my favorite things to do with dad. He and his agent, Roger Adams, and I would sit in hotel rooms and watch Wheel of Fortune. We’d bet a quarter who could figure out the answer. I loved just playing golf with dad and hanging out at Andy Williams’ house in Branson after the shows. I kind of brought a normalcy to dad because he hung out with a lot of my friends especially in Branson. They weren’t phased by his celebrity. They just let him be who he was, and they loved him for that. Melissa Parker (Smashing Interviews Magazine): Did he feel just as comfortable with your friends as he did being around other celebrities? My dad was a character, but what a wonderful human being. I did a show with Collin Raye a couple of years ago. He was doing a tribute to dad and asked if I would come and sing “Let It Be Me” with him. That was in Ohio. I’ve gotten to know many of dad’s fans because I traveled so much with him. They were like family. They all came to shows, and I watched their kids grow up. So Seth, a fan in Columbus, asked me to stay with them. Seth asked, “Do you want to wear one of your dad’s shirts tonight?” I go, “How do you have one of my dad’s shirts?” My dad had shipped him a box of clothes because backstage Seth would say, “Glen, I really like that shirt,” and dad would say, “What’s your address?” That’s just how dad was. He was so giving and so thoughtful. I really miss him. I really miss him a lot. « Dree Hemingway Interview: "I Am More Than Just This Member of a Historic Family"
Debbie, my heart go out to you and your siblings (except kim’s Kids). How horrible for all of you and especially Glen that kim kept him from all of you. I saw Glen perform in Missouri during the end of his tour. Although I really enjoyed seeing him had I known at the time what kim was doing I would not have gone. Hearing him over the years and watching his program on tv with Billie, Travis and his two siblings would have been good enough memories of what a great entertainer and person he was would have been good enough. I’m great full for your many great memories of him. God bless you all. I would never pay money to see ashley or shannon! They used a great man for their benefit. Thank you so much for this wonderful interview with Debby Campbell-Cloyd. She is so special to so many and we know how much she loved her dad and he loved her. So glad she was so candid on so many things that we have often wondered about and so glad to hear it coming out into the open. We received her CD Tribute to her dad and love every song. She has such a wonderful voice and loved it when we would go to Glen’s concerts and he would sing with Debby. Their voices blended so well together. Again, thank you for writing this article and thank you Debby for being so honest. My husband Kevin andI were great fans of Glen and saw him every time he came to England.We saw him with Debbie at the Bridgewater hall,Manchester and his farewell tour.My darling Kevin died last year too,after 54 happy years andglens music lives on with memories of our lives.forget all the bad things Debbie, keep the memories and love of your father close , he had a gift and a love of life. I think glen campbell was the most talented singer and guitar player ever . His Sioux Falls concert is something that will never be heard or seen again ever. I watch it every single day and always replay at least four or five songs. The feelings that come over me when I hear it just make me wipe my eyes. Just wish he could have lived longer and I believe he never got the recognition that he so dearly deserved.I watched David Gates and him perform in 1969, it was beautiful hearing their voices and harmonizing together.His last performance of country boy in Phoenix was absolutely the best playing I have ever heard no one an I do mean no one could hold a candle to that playing it was like he was pocessed by the good Lord himself. It was eerie the sound that came out of that guitar. God bless you glen and I will never forget you and what you did for country and crossover music. Great article. God bless you and your siblings Debby. It shines bright what kind of character you are dealing with in your fathers wife. So sad that she would keep you from seeing your father. The Will would obviously involved you so good luck with your case. God bless your Dad was a beautiful man.